Abstract: How to store a graph data structure in a DBMS, and query it to solve many of the problems of social networks. Graphs are ubiquitous. Social or P2P networks, thesauri, route planning systems, recommendation systems, collaborative filtering, even the World Wide Web itself is ultimately a graph! Given their importance, it's surely worth spending some time in studying some algorithms and models to represent and work with them effectively. 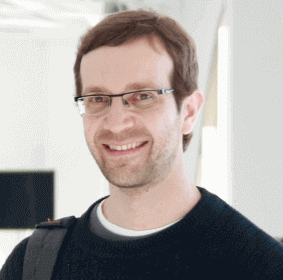 In this short article, we're going to see how we can store a graph in a DBMS. Given how much attention my talk about storing a tree data structure in the db received, it's probably going to be interesting to many. Unfortunately, the Tree models/techniques do not apply to generic graphs, so let's discover how we can deal with them. Two main data structures for the representation of graphs are used in practice. The first is called an adjacency list, and is implemented as an array with one linked list for each source node, containing the destination nodes of the edges that leave each node. The second is a two-dimensional boolean adjacency matrix, in which the rows and columns are the source and destination vertices, and entries in the array indicate whether an edge exists between the vertices. Adjacency lists are preferred for sparse graphs; otherwise, an adjacency matrix is a good choice. When dealing with databases, most of the times the adjacency matrix is not a viable option, for two reasons: there is a hard limit in the number of columns that a table can have, and adding or removing a node requires a DDL statement. Joe Celko dedicates a short chapter to graphs in his "SQL for Smarties" book, but the topic is treated in a quite hasty way, which is surprising given his usual high standards. The first table (nodes) contains the actual node payload, with all the interesting information we need to store about a node (in the example, feat1 and feat2 represent two node features, like the age of the person, or the location, etc.). If we want to represent an undirected graph, we need to add a CHECK constraint on the uniqueness of the pair. NB: a UDF in a CHECK constraint might be a bit slow. An alternative is to have a materialized view or force an order in the node pair (i.e. "CHECK (a < b)", and then using a stored procedure to insert the nodes in the correct order). Now that we know how to store the graph, we might want to know which nodes are connected. 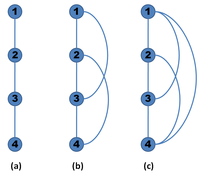 Traversing the full graph usually requires more than a query: we can either loop through the connected nodes, one level a time, or we can create a temporary table holding all the possible paths between two nodes. We could use Oracle's CONNECT BY syntax or SQL standard's Common Table Expressions (CTEs) to recurse through the nodes, but since the graph can contain loops, we'd get errors (unless we're very careful, as we'll see in a moment). Kendall Willets proposes a way of traversing (BFS) the graph using a temporary table. It is quite robust, since it doesn't fail on graphs with cycles (and when dealing with trees, he shows there are better algorithms available). His solution is just one of the many available, but quite good. The problem with temporary tables holding all the possible paths is it has to be maintained. Depending on how frequently the data is accessed and updated it might still be worth it, but it's quite expensive. If you do resort to such a solution, these references may be of use. Before going further in our analysis, we need to introduce a new concept: the transitive closure of a graph. The transitive closure of a graph G = (V,E) is a graph G* = (V,E*) such that E* contains an edge (u,v) if and only if G contains a path from u to v.
In other words, the transitive closure of a graph is a graph which contains an edge (u,v) whenever there is a directed path from u to v.
As already mentioned, SQL has historically been unable to express recursive functions needed to maintain the transitive closure of a graph without an auxiliary table. There are many solutions to solve this problem with a temporary table (some even elegant), but I still haven't found one to do it dynamically. Here's my clumsy attempt at a possible solution using CTEs. Notice the WHERE condition, which stops the recursion in the presence of loops. This is very important to avoid errors. One of the fundamental characteristics of networks (or graphs in general) is connectivity. We might want to know how to go from A to B, or how two people are connected, and we also want to know how many "hops" separate two nodes, to have an idea about the distance. For instance, social networks like LinkedIN show our connections or search results sorted by degree of separation, and trip planning sites show how many flights you have to take to reach your destination, usually listing direct connections first. There are some database extensions or hybrid solutions like SPARQL on Virtuoso that add a TRANSITIVE clause to make this kind of queries both easy and efficient, but we want to see how to reach the same goal with standard SQL. NB: setting the WHERE condition for the source node in the first part of the CTE is way more efficient than moving it out of the VIEW, since the selectivity is much higher and you avoid retrieving nodes you don't need. This query will return all paths from A to B, sorted by distance. If we're showing the trip planning results, then we have a list of all possible travel solutions; instead of sorting by distance, we might sort by price or other parameters with little changes. If we're showing how two people are connected (LinkedIN), then we can limit the result set to the first row, since we're probably interested in showing the shortest distance only and not all the other alternatives. Of course to get the immediate connections there's no need for a recursive query (just use the one presented at the previous paragraph), but I thought I'd show it anyway as a first step towards more complex queries. 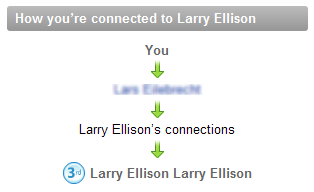 LinkedIN has a nice feature to show "How this user is connected to you" for non directly connected nodes. In the above query, we select the immediate connections of the two nodes separately, and then select the shared ones. For nodes having a distance equals to 3, the approach is slightly different. Then you select the paths between those nodes. But there's a different approach which is more generic and efficient, and can be used for all the nodes whose distance is bigger than 2. The idea is to select the immediate neighbours of the starting node that are also in the path to the other node. A similar but slightly different requirement is to find those nodes that are most strongly related, but not directly connected yet. In other words, it's interesting to find out which and how many connected nodes are shared between any two nodes, i.e. how many "friends" are shared between two individuals. Or better yet, to find those nodes sharing a certain (minimum) number of nodes with the current one. This could be useful to suggest a new possible friend, or in the case of recommendation systems, to suggest a new item/genre that matches the user's interests. There are many ways of doing this. In theory, this is bordering on the domain of collaborative filtering (also check this and this), so using Pearson's correlation or a similar distance measure with an appropriate algorithm is going to generate the best results. Collaborative filtering is an incredibly interesting topic on its own, but outside the scope of this article. A rough and inexpensive alternative is to find the nodes having distance equals to 2, and filter those that either have a common charateristic with the source node (went to the same school / worked at the same company, belong to the same interest group / are items of the same genre) or have several mutual "friends". Once you have selected these nodes, you can filter those recurring more often, or give more importance to those having a certain feature in common, or pick one randomly (so you don't end up suggesting the same node over and over). In this article I had some fun with the new and powerful CTEs, and showed some practical examples where they can be useful. I also showed some approaches at solving the challenges faced by any social network or recommendation system. You are advised that depending on the size of the graph and the performance requirements of your application, the above queries might be too slow to run in realtime. Caching is your friend. Many of the queries in this article have been revised, refer to these slides for changes.